I’ve been to Athens before, so I’ve already done the usual Athens itinerary like visiting the Acropolis. So, with only one free day after my conference was over, I signed up for the Athens One Day Cruise. I love being on the water, and the cruise promised to include visits to three different islands: Hydra, Poros and Aegina. I never thought I’d find myself in the middle of the Saronic Gulf listening to karaoke sung in Chinese! Tunelessly. With dancing. It’s the kind of culture clash moment I enjoy. The fact that those Chinese tourists thought it was appropriate to take over the microphone from the professional pianist on the cruise and start singing, in front of perhaps 100 people, almost all strangers, doesn’t annoy me. It’s funny. Not that I’m laughing at them. I’m laughing at the serendipity of it all. The cruise employees got back at the man who started the karaoke by making him embarrass himself during the Greek dancing show at the end of the day. This is not the kind of trip I normally would take. I would have taken a faster ferry boat, without the bells and whistles of additional itineraries, traditional Greek music, or a buffet meal. I don’t generally go for traditional music or performances that have been laid on just to entertain tourists. It reminds me too much of some very unhappy Masai “warriors” I once saw dancing listlessly for a group of white tourists in Tanzania. I prefer to stumble upon cultural events that happen organically, organized by and for local people. On the other hand, the islands we visited on the cruise are lovely. Hydra was our first stop: an island of 3000 year-round inhabitants where no cars, motorcycles or even bicycles are allowed. The only mode of transportation available, besides your own two feet, is riding a donkey. Every road is a stairway, and those roads beckoned me in every direction. I would have loved to stay a few nights to explore them, but also to enjoy the peace and quiet. Poros seemed less well-preserved than Hydra, but I took a quick walk up to the bell tower above the town and then through some of the back streets. There was more immediate evidence of Greece’s financial crisis here. Not visible on the main street along the water, the streets behind held quite a few boarded-up buildings and empty storefronts. 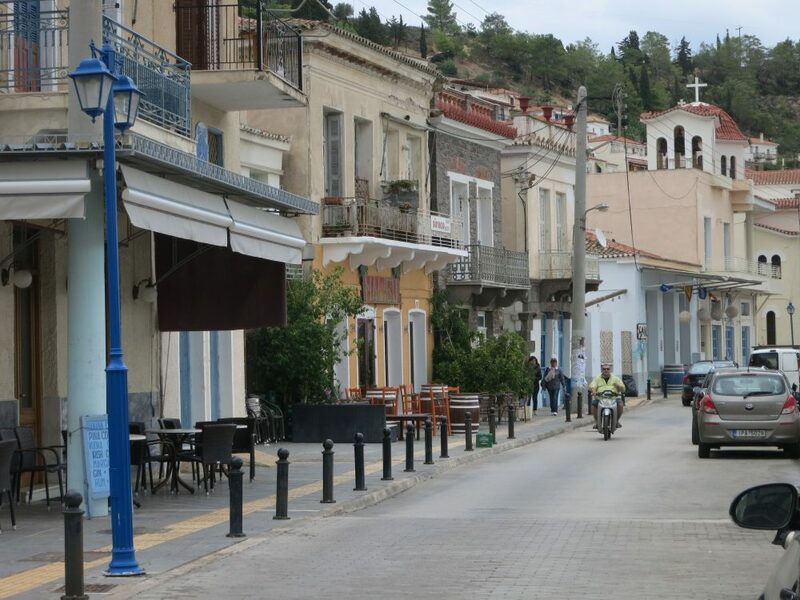 It’s a bigger island though, which implies more back roads to explore, and the Peloponnesus is just a very short ferry ride away. As with the other two islands, I would have liked to spend more time on Aegina. I didn’t get a chance to explore the town at all. 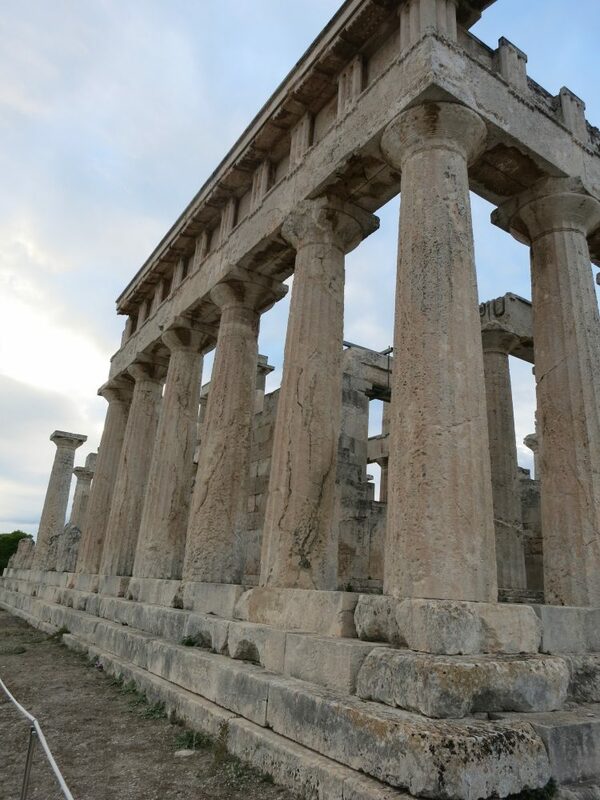 We were ushered onto a bus to go visit the impressive Temple of Aphaia, dating from about 500 BC, and the much more recent Greek Orthodox Church of Saint Nectarios. I wanted to see both, but couldn’t see either one well. This was partly because of the tight schedule, and partly because I was too cold by this time to stay outside for long: I completely misjudged the weather. The hills covered in pistachio and olive groves that we passed along the way would have been fun to explore, and I would have liked to be able to stop and enjoy the stunning views I glimpsed from the bus. Apparently it is possible, for the same price, to take this one-day cruise spread out over more days, and that’s certainly what I’d recommend. 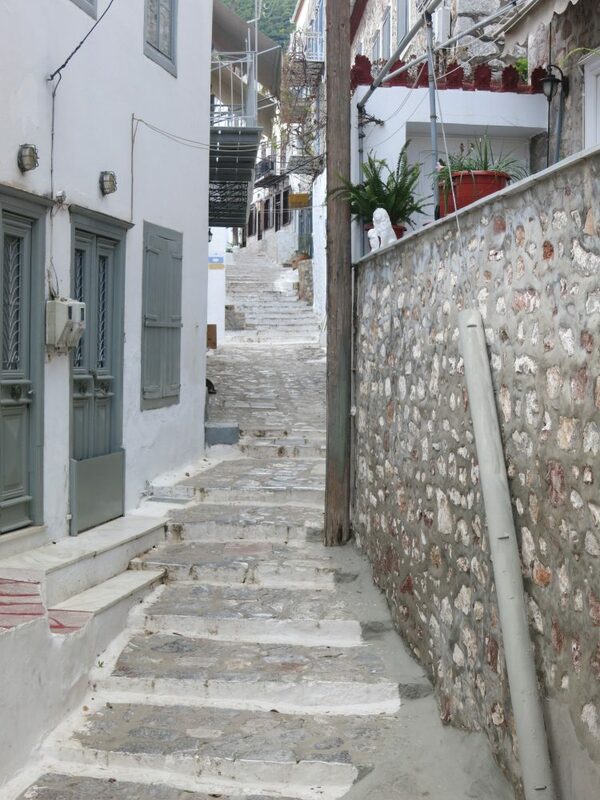 If I had to choose one island to visit, it would be Hydra, for its beauty and quiet and opportunities to walk. This trip makes for a long day and tries to fit a lot into the day. But if one day is all you have, it’s a good solution. You’ll spend most of the time on the boat, though, not on land, so prepare for that. 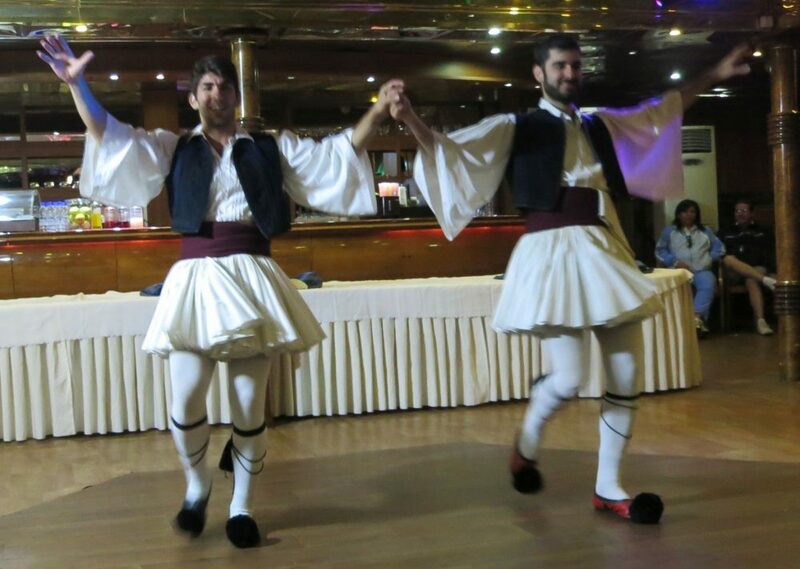 Go with a big group of friends, buy some ouzo, and enjoy the cheesy show – Greek dancers in skirts with tasseled socks – and live music. Alternatively, go on a hot summer day and give the tourist trappings (and tour groups) a miss. Instead, bring a book to read, and while away the hours enjoying the cooling breezes on deck. If you have more time, get off and stay a night or two at each island before moving on to the next. Have you been to any of these islands or taken this one-day cruise? What did you think? Go ahead and add a comment below! 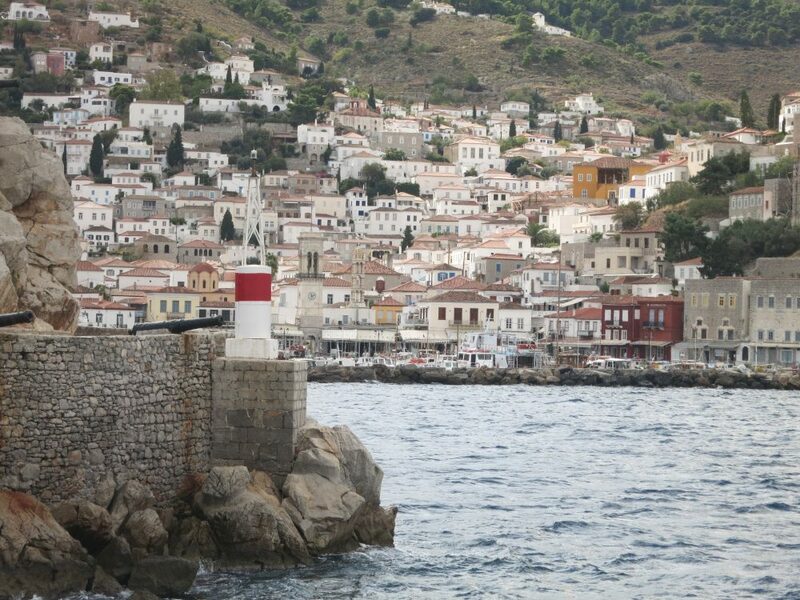 The stairs of Hydra beckon! Random Chinese Karaoke makes it even more memorable! I don’t think I’ll ever forget it. Or the dancing, for that matter. The audience participation part was hilarious! Thanks for commenting! That sounds like much more my style, with a little more time in each place, and without the cheesy show, though that was fun after all. Thanks for commenting! I think with all these things trying to pack in too much doesn’t work, but at least you got a peek into where you’d like to revisit. I like your idea of one or two nights per island and Hydra sounds amazing, although not even bicyles? Wow. Yeah, surprising, right? But they’d have nowhere to go except the waterfront. Too many stairs! My problem is that there are far too many places I’d like to revisit, added to all the places I’d like to visit for the first time!